Electroconvulsive therapy (ECT) is a form of psychiatric treatment that involves inducing seizures with the use of electrical stimulation while a patient is under general anesthesia. 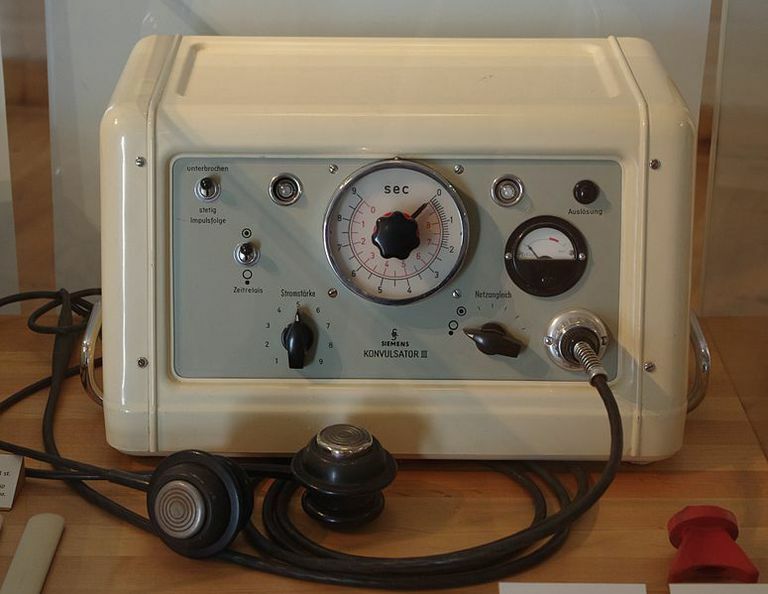 Originally known as electroshock therapy, ECT was first introduced by a pair of Italian psychiatrists in 1938. However, the use of induced seizures to treat mental illness dates back as far as the early 1500s. It became a popular psychiatric technique during the 1940s and 1950s, particularly in the treatment of severe depression. Stigma attached to the use of ECT led to a decline in its use during the 1960s. The emergence of effective psychiatric medications to treat depression also contributed to its decline. Today, electroconvulsive therapy is still used as a treatment for cases of severe depression, mania, and schizophrenia, although its use remains controversial. Approximately 70 percent of ECT patients are women. Remission rates are estimated to be between 60 and 70 percent. In one report, between 29 and 55 percent of patients believed that they had experienced permanent memory loss as a result of ECT. In England, more than 11,000 people receive ECT each year. Between 1975 and 1980, there was a 46 percent decline in ECT use in the United States. ECT use remained steady throughout the 1980s and even began to rise through the next decade. More than a third of ECT patients are age 65 and older. Use in children and teens remains relatively rare. In a 1993 study, less than 0.20 percent of patients receiving ECT were under the age of 18. While the use of ECT remains controversial, many recent studies and literature reviews suggest that it can be a safe and effective treatment, particularly in the case of severe depression. By 1941 electroconvulsive therapy (ECT) was used by nearly half of the mental health institutions in the United States. ECT has been found effective for some patients who are unresponsive to other therapies, including antidepressant drugs. One ways to decrease the possibility of brain damage is the areas of stimulation and use it minimally, only when other treatment methods have failed. The evidence supporting the efficacy of ECT in depression is overwhelming. In several studies, ECT was found to be far more effective than other methods. There is still significant stigma attached to its use, so it is used sparingly. Side effects from ECT include memory loss, even permanent loss, fractured bones, headaches and even death. Serious complications do exist, particularly the risk for permanent brain damage. Before undergoing ECT, talk with your doctor to make sure you have exhausted other options and to discuss your risks. Carney, S. "Electroconvulsive Therapy". British Medical Journal. 1343-1344. 2003. Mental Health America. Electroconvulsive Therapy. 2015.